When deciding on a wood fence there are many factors to consider, first off what height of fence will you require. A beautiful combination between providing security and elegance to your residential, commercial, and industrial properties. Chain Link Fencing is the most commonly used and is the most economical choice of fencing around. 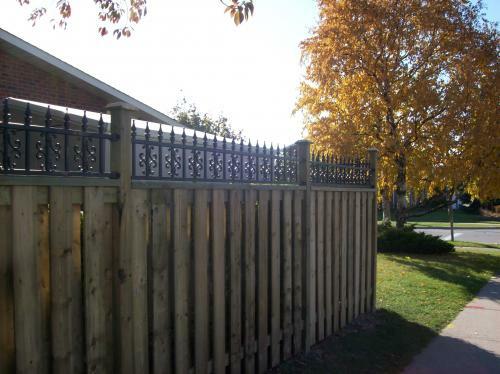 FG Fencing has provided the highest quality custom work to customers time and time again. FG Fencing & General Construction Inc.
For over 25 years, FG Fencing has catered to the needs of the residential, commercial, and industrial sectors with quality fencing. Our unique combination of experience and quality products has enabled us to take pride in every job we embark on. Our service areas include: Etobicoke, North York, King City, Aurora, Newmarket, Alliston, Bradford, Barrie, and parts of Toronto, Mississauga, and Brampton. Watch us on Holmes Makes It Right! FG fencing... Thanks for making it right. John, I wanted to take a moment to thank you for all your support, efforts and hard work. My faith in the trades has finally been renewed.